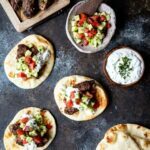 Place 2 lamb kefta on each mini naan. Top with Israeli salad and tzatziki. Garnish with chopped mint or parsley and devour. Combine ground lamb, onion, garlic, lemon zest, mint, coriander, cumin, dried oregano, and cayenne pepper in a medium mixing bowl. Season generously with Kosher salt. Form mixture into 16 mini logs. Heat grill or large skillet over medium-high heat. If using skillet, add 1 tablespoon of canola or vegetable oil. Cook lamb kefta until just cooked through, flipping once halfway through cooking. Combine all ingredients in a small mixing bowl and season with Kosher salt.